Uses:- Glatiramer Injection is used to treat a type of multiple sclerosis that occurs when symptoms appear in cycles of worsening and improvement (relapsing/remitting multiple sclerosis-MS). 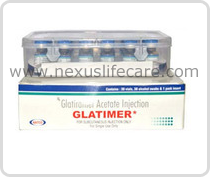 Glatiramer Injection is a protein that is thought to work by preventing your immune system from attacking the nerves in your brain and spinal cord. Side Effects:- Injection site reactions (e.g., pain, redness, soreness, and swelling) may occur. Nausea, chills, joint aches, neck pain, or headache may also occur.